Theo Simpkin is a young science student at the University of Melbourne when he senses God's call to share the good news with the people of China. Meanwhile Olive Kettle, an Australian country girl is working as a stenographer and bookkeeper in a Melbourne CBD accountant's office while helping to support her widowed mother. Theo departs, traveling more than 8000 kilometres to commence his ministry in China, yet the divine matchmaker was at work in both their lives. Discover how Theo and Olive struggle to find God's will for their futures, despite the distance and the difficulties they face. Both were descended from pioneers, and Theo and Olive need every bit as much courage, perseverance and faith as they travel on foot, or by pony or mule, through the precipitous Yunnan mountains. During their decades of service, they encountered a unit of the Red Army on the famed Long March, were impacted by the Japanese invasion and lived through the Communist revolution. Featuring frequent quotes from letters written by Theo and Olive, this book provides an intimate glimpse into what life was like in the rugged mountains of China. This biography follows Theo and Olive wherever God led them--in Australia, China and India--showing his care and provision as two ordinary Australians travel along the path A Foot Wide on the Edge of Nowhere. In spite of persecution and hardship--as witnessed by a brief update from Christians now living in Yunnan--God's Word continues to bear fruit with joy. 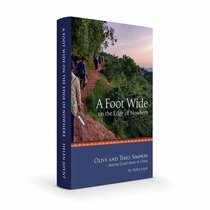 About "A Foot Wide on the Edge of Nowhere: Olive and Theo Simpkin - Sharing Good News in China"